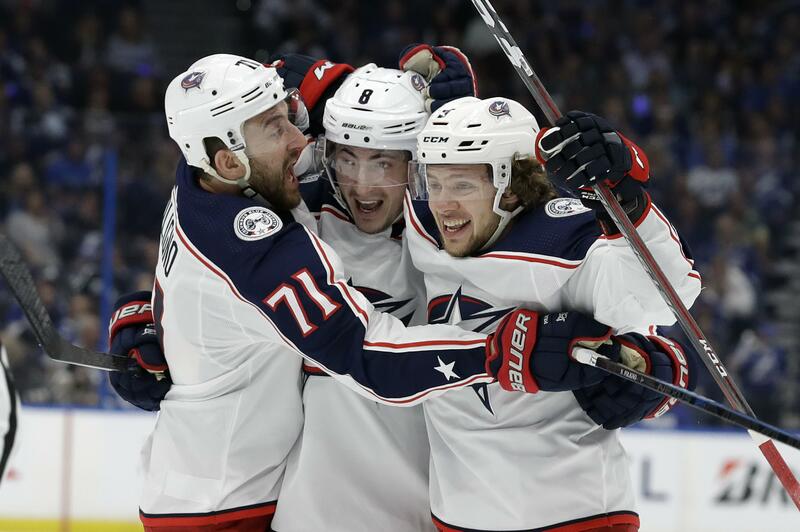 Fri., April 12, 2019, 10:30 p.m.
TAMPA, Fla. – Matt Duchene had a goal and three assists, Sergei Bobrovsky made 23 saves, and the Columbus Blue Jackets stunned the Tampa Bay Lightning 5-1 on Friday night to take a 2-0 first-round series lead. UNIONDALE, N.Y. – Jordan Eberle and Josh Bailey scored in the third period and New York beat Pittsburgh for a 2-0 lead in their first-round playoff series. WINNIPEG, Manitoba – Oskar Sundqvist scored twice to lead the St. Louis Blues over the Jets. SAN JOSE, Calif. – Mark Stone scored the tiebreaking goal on a power play created by a penalty that negated an apparent San Jose goal and the Vegas Golden Knights responded after blowing a three-goal lead in the first period to beat the Sharks and tie their playoff series at one game apiece. Published: April 12, 2019, 10:30 p.m.